Your sleeping position could be the cause of your back and neck pain, stomach troubles, snoring, even premature aging and wrinkles. You doubt….. “Eighty percent of the population will develop back problems at some point during their lives oftentimes caused or aggravated by the way they sleep,” says a senior orthopedic spine surgeon. So getting seven hours of sleep alone is not enough, but knowing the right posture that suits your body pattern too is important. Sleeping on the back makes it easier for our head, neck, and spine. It keeps the body in a neutral position. This position gives relief for people with sinusitis and prevent hip and knee pain. Sleeping on the back with legs and arms spread out can prevent stress on joints. Sleeping on the back with head slightly elevated and the stomach little lower will position stomach below the esophagus, which will prevent any food from coming back up. It is best suited to avoid heartburn. But on the back position can trigger lower back pain and can lead to snoring and sleep apnea. The lower back pain can be thwarted to some extend by placing a pillow below the knees and thus can off-load the pressure falling on lower back. On the back – Soldier: This position is favored by about less than 10% of the population. People opting for this sleep position sleeps on their back, with their arms straight down at their side. On the back – Starfish: People opting for this sleep position sleeps on their back ,with their arms up over their head. According to experts sleeping this way can put pressure on the nerves of the shoulders, which can lead to pain. Most people prefer side sleeping. This posture will help to avoid common problems like snoring and sleep apnea. Pregnant women are advised to sleep on their left side for optimal blood flow. More women than men prefer this position. While sleeping on the side, do not push hands under the pillow or head. This is a bad posture. Try to keep the arm lower than at a right angle to body. One negative point is, it prevent one from breathing deeply because diaphragm gets restricted due to curling up. Another problem of side-sleeping is facial wrinkling. For women, side sleeping can cause breast sagging and in men kidney stones. On the back – Fetal: Sleeping with legs bent and curled toward torsos is called fetal position. The fetal position can also help to ward off conditions like Alzheimer’s or Parkinson’s. Studies carried out on animals suggests that brain does a better job of clearing waste when sleeping on side rather than on back or stomach. Experts suggests it’s better not to curl up too much to prevent strain on back and to ease out breathing. 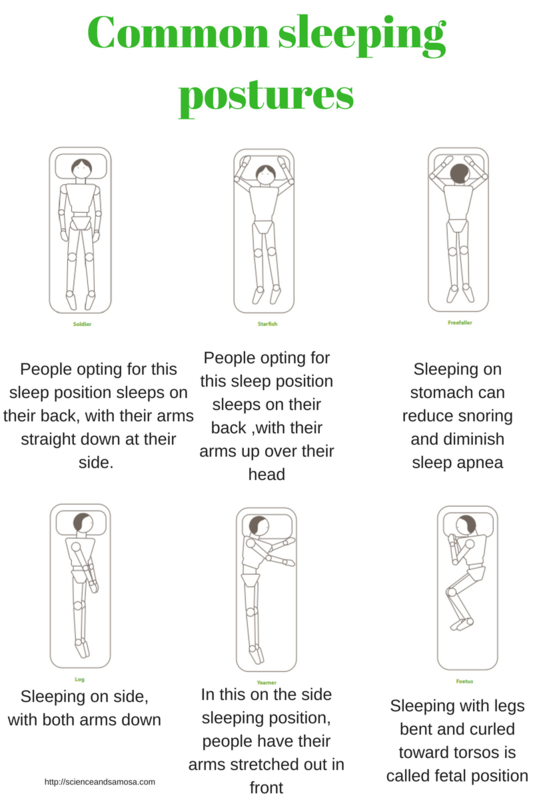 On the back – Log: Sleeping on side, but with both arms down. This position will keep spine straight and is extremely helpful to those suffering from back pain. On the back – Yearner: In this on the side sleeping position, people have their arms stretched out in front. They have the same pros and cons as that of log sleepers. The arms out position of yearners in addition can cause additional pressure on the shoulders and arms, leading to soreness. Sleeping on stomach can reduce snoring and diminish sleep apnea. It can even help someone if he is suffering from digestive issues. But it can cause strain on lower back and can cause potential neck pain. This position makes it difficult to maintain a neutral spine position while sleeping. Putting a pillow under pelvis and lower abdominal area can ease out back pain problem. We must be careful the way we get out of the bed after a night’s sleep because the spinal discs are full of fluid. Take some deep breathing and do little bit of stretching. Before getting out of bed, bend knees and keep feet flat on the bed. Then roll on to one side, push hands to raise yourself up and lower your legs over the side of the bed. Stand firmly on both legs. This will help protect your back. Very informative and educative post Hena. I have been experiencing lower back pain since last few months. My observation is that if I sleep on my back, for longer duration, the pain aggravated. I will try the tip suggested here to keep a pillow under my knees.